for the record, i am a fan of the 2015 topps buybacks. i like the stamp that was added to the cards much more than the 75th anniversary stamp that was on 2014 topps buybacks, and much more than the multi-colored 65th anniversary stamps that were on 2016 topps buybacks. i have purchased many lots and singles of the 2015 buybacks in an effort to acquire as many dodgers as i can. shows that the beard and horns - classic devilry doodling - were applied to the card prior to it achieving buyback status. what might have possessed a person, assumedly a youth, to disfigure this card to such a degree? 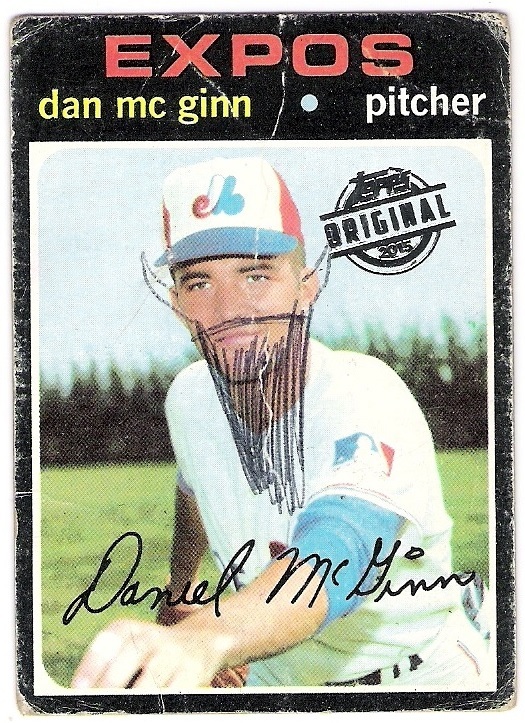 here, for the record, is the back of the card, which features a clean-shaven mcginn, unaltered by dastardly sketching. 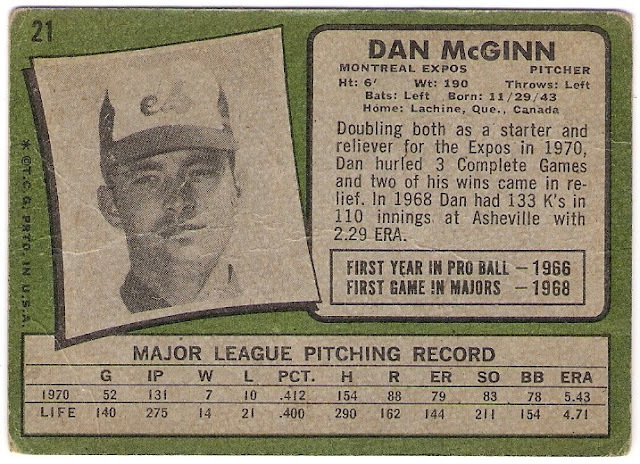 mcginn didn't pitch in the big leagues in 1971 until june, so perhaps the owner of the card was disappointed to open a first series pack and get a guy who wasn't on a major league roster at the time. or, perhaps this fan was listening to a game in which mcginn pitched poorly, of which there were several during the 1971 season. my guess is that the card's owner figured out that mcginn's presence in a game was a curse against the expos, as the team lost 25 of the 28 games in which mcginn appeared during the 1971 season, including the last 22.
regardless of the reason, i envy the person who opened a pack of cards in 2015 and found this card. I've got a lot of similar cards (a '72 Johnny Unitas probably being the strongest of the bunch), but this...with the buyback stamp...fantastic. You are very, very lucky to own it. this is very interesting and impressive post. all the details are awesome and good in this post.